This is where boring ends. The North Shore is the Midwest’s premier ice climbing destination. Combine frozen waterfalls with spectacular scenery and you have the ultimate winter adventure. Ice climbing with our professional guides instills the knowledge and confidence necessary to enjoy this exhilarating winter activity. If you are a new climber who needs instruction or an experienced climber who wants to hone your skills, call us at 218-387-3136 to schedule a high voltage day of ice climbing. Contrary to popular opinion, the North Shore does have a summer season. If you are looking for some warm weather options, check out our rock climbing tours. 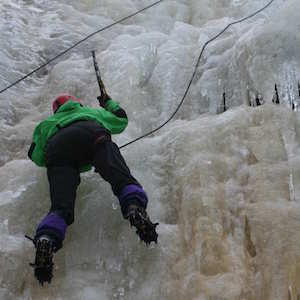 Intro to Ice Climbing tours are $200/person; $150/person for groups of two or more. Meet at Stone Harbor at 9:00 am to get geared up. Before we start climbing, we review fundamental ice climbing techniques, communication and safety procedures. After that, your guide transports you to one of the North Shore’s stunning ice climbing locations for a full day of thrills. Throughout the course of the day, you learn to tie a figure eight knot, how to belay and rappel, how to use ice tools and how to safely and effectively place crampons. 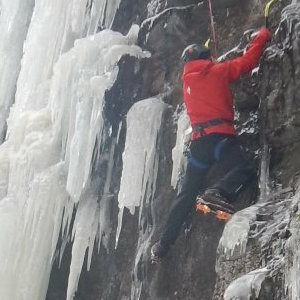 The flow of the day includes climbing on a variety of ice formations, along with a review of different techniques and skills needed to manage risk and maximize your climbing ability. The Mastering Basic Ice Climbing course is $225/person. Meet at Stone Harbor at 7:00 am to talk about the material that will be covered for the day and get fitted for equipment. Next we head to Cascade River where you spend the day with our experienced guide learning the ins and outs of basic ice climbing technique. 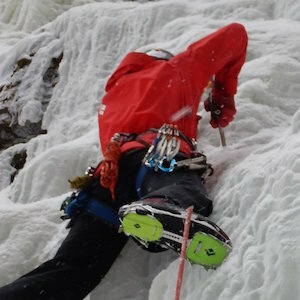 Learn to place ice tools and crampons, belay, rappel and tie into the rope. 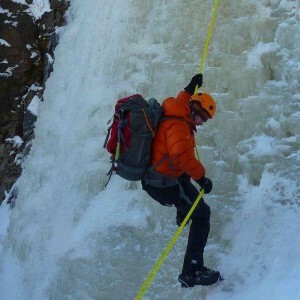 This course goes above and beyond our Intro to Ice Climbing course with in-depth instruction that takes you from newbie to competent ice climber. The Anchors for Top Rope Ice Climbing course is $225/person. Start your day at Stone Harbor at 7:00 am to talk about the material that will be covered for the day and get fitted for equipment. From there your guide transports you to Cascade River where you learn the art and science of anchor building for winter climbing. It takes someone with a good working knowledge of the basic systems of climbing anchors, plus good judgement, to build anchors safely and efficiently. Learn the craft of anchor building under the instruction of a certified guide. This course covers STRADS anchors plus ice screw placement and things to consider when making anchors, especially for ice routes. 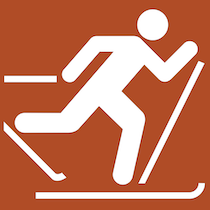 The Leading Ice course is $225/person. You meet your guide at Stone Harbor at 7:00 am to get fitted for equipment and discuss the material that will be covered for the day. Your next stop is Devil Track River or Manitou River learn about leading the rope up an icefall. Learn to place ice screws, clip the rope and rappel off the climb, plus strategies for conserving energy and being efficient while on the sharp end of the frozen rope. Previous ice climbing experience is required for this course. The Intro to Mixed Climbing course is $225/person. Push your way up a grade or two with a day focused on hard vertical ice climbing and an intro to the exciting world of mixed climbing. Learn to eye up difficult formations of ice and begin to see a line to the top. Focus on the tenuous placements required for mixed climbing and wrap up the day with a look at training techniques to take you higher! Previous ice climbing experience is required for this course.